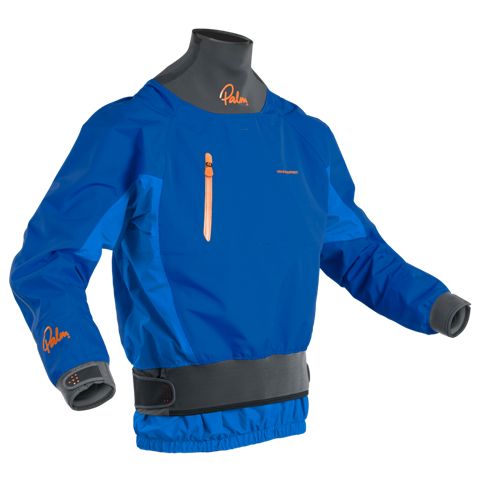 The Palm Atom whitewater cag is a high performance 3-layer men's expedition jacket guaranteed to perform in the harshest environments. Featuring latex neck and cuffs and reinforced elbows. The Palm Atom is a top end dry cag featuring industry leading technology, the Atom is ideal for all types of whitewater kayaking, surfing and playboating. Palm have managed to load the Atom full of features which make it one of the leading whitewater cags available. Such features that the Atom offers is its XP3 layer fabric which offers outstanding durability and protection from the elements. This jacket also comes with a fully articulated cut that also includes pre-bent arms making for a good fit with no excess material enabling you to maximise the manoeuvrability that is available. The pre-bent arms are also feature armortex padding to protect your elbows and the cag itself. The Palm Atom jacket features a latex neck and wrist seal with adjustable outer collar and cuffs. There is also a double waist with a large adjustable waist band to make a good seal when worn with a spray deck. The Atom also boosts a chest pocket. The Palm Atom cag is ideal for all types of kayaking and canoeing and will keep you protected from the water and weather but will not keep you warm. This is where you will need to wear a thermal layer under the Atom to keep you warm. We offer a delivery service for the Palm Atom throughout the UK & Ireland to home and work addresses. We will endeavour to despatch all orders for delivery on the next working day. Orders placed on a Friday will be dispatched the following week. Buy a Palm Atom online from our website and collect from our shop at Lee Mill, Plymouth, Devon or you can collect from any branch within the Canoe Shops Group. There is no cost associated with this.